Fig. 1. Scatter plots and regression lines between the base 10 logarithms of the forest stand volume (log10V) on the x-axis and the ratios of the decomposition powers (surface, canopy, double-bounce and helix scatterings) to the total power (P/TP) on the y-axis, for a) 2007, b) 2009 and c) 2010. Fig. 2. 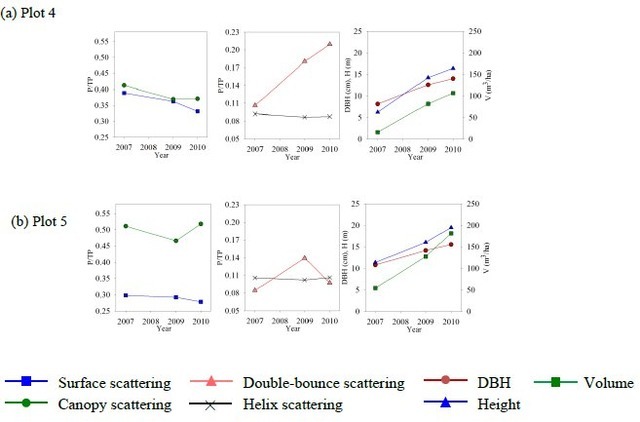 Line graphs of the surface and canopy scattering powers (left), the double-bounce and helix scattering powers (center) and forest parameters: DBH, tree height and standing volume (right) for (a) Plot 4 and (b) Plot5.